By Prof. Marcello Ferrada de Noli. Chairman of Swedish Doctors for Human Rights. .As reported in a recent article by KILTR, the Swedish Section of Amnesty International (here referred as to Amnesty Sweden) declared in a comment sent by legal advisor Madelaine Seidlitz, that my article in The Indicter “misrepresented the policy-making process” of Amnesty Sweden. That article was referring in the main the contact in September 2012 between a former agent of Swedish security services and Amnesty Sweden, and in which the ex-agent dictated a course of action for Amnesty Sweden on the Assange case. Amnesty Sweden could not deny the existence of their email correspondence between the ex agent (Martin Fredriksson), however Amnesty Sweden says that what they have decided on the case Assange had nothing to do with what Fredriksson requested. In fact, what Amnesty Sweden decided it was exactly what the ex-agent of Swedish security services dictated to them in his email of 27 September 2012. I still insist that the parent organization Amnesty International based in London should intervene. We have already pointed out in our rebuttal to Amnesty Sweden that the criticism raised on behalf of Swedish Doctors for Human Rights do not refer to an isolated episode, but rather to a behaviour; meaning, similar stances repeated precisely along their “policy-making process”, which Amnesty Sweden now says we “misrepresent”. 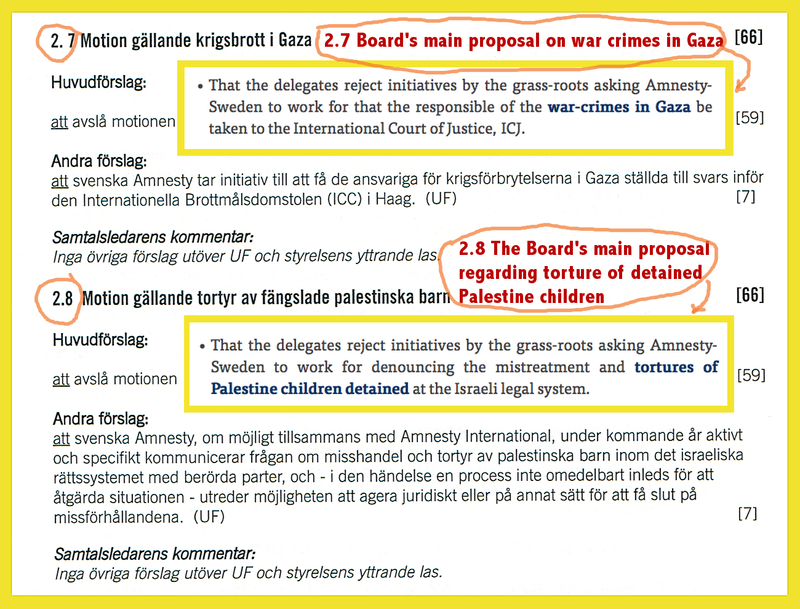 To further illustrate my argument that I put forward in one interview done recently by journalist Erik Sandberg, I will here below review some facts, as they happened at the highest level of Amnesty Sweden’s “policy-making process”, namely, their annual conference. Here below this illustration from the 2014 annual conference of Amnesty Sweden. It partly transcribes previous reports Dr Leif Elinder and I had in The Profesors’ Blog [See down below interview I conducted with Dr Elinder]. 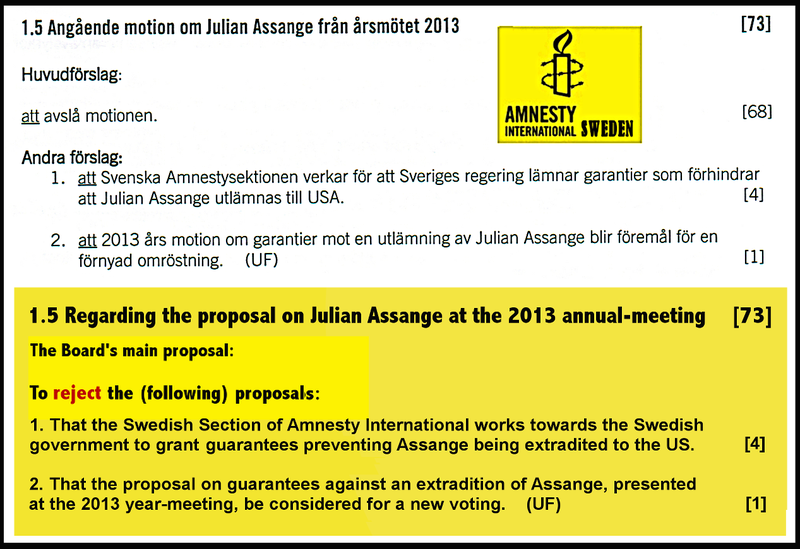 The Swedish Section of Amnesty International voted to reject human-right actions on cases Assange, Snowden and tortured Palestinian children; and still doesn’t recognize Chelsea MAnning as prisoner of conscience in the U.S.
That the delegates reject initiatives by the grass-roots asking Amnesty-Sweden to work for that the Swedish government gives guarantees that Julian Assange will not be extradited to the US. That the delegates reject initiatives by the grass-roots asking Amnesty-Sweden to work for that the Swedish government grants asylum to Edward Snowden. That the delegates reject initiatives by the grass-roots of making compulsory to the Amnesty-Sweden Board to implement a campaign for the liberation of all prisoners at Guantanamo who cannot be convicted in a civilian court. That the delegates reject initiatives by the grass-roots asking Amnesty-Sweden to work for that the responsible of the war-crimes in Gaza be taken to the International Court of Justice, ICJ. That the delegates reject initiatives by the grass-roots asking Amnesty-Sweden to work for denouncing the mistreatment and tortures of Palestine children detained at the Israeli legal system. The board’s proposals above won with a clear majority of votes from the delegates. And one more question: How come that after seven years still whistleblower Chelsea Manning is not recognized by Amnesty Sweden as Prisoner of Conscience in the US? The Professors’ Blog [TPB] – The position of Amnesty-Sweden’s board members was known already, through your op-ed published by us, and in Swedish by Prof. Anders Rommesjö on Jinge.se. So I will ask you about the rest of the delegates, how come that the majority of delegates voted against your proposals on this variety of human-rights issues? Leif Elinder [LE}– My impression is that the delegates in general, the members of the board included, have only a precarious background-knowledge on the cases of, for instance, Assange and Snowden. TPB – But didn’t you have the possibility of explain to the delegates the reasons for your proposals, for instance the updates received since the last vote in 2013 on the situation for Assange in the US? LE – Those possibilities were yet limited. As I explained in my op-ed the board changed the procedures by which the proposal-authors could reach the rest of the delegates. To star with, we were scattered in various “opinion-stations” in which we as proposal-authors could elaborate some arguments, but they were operating “simultaneously”, and also picked up by the delegates in voluntary basis; in other words it was clear tat the message would not reach the delegates as a whole. Another aspect is that when we finally had the voting today, which happened with all the delegates being present, we (the authors of the respective proposals) were given only two minutes to state our cause. I mean, we were expected to manage in those two minutes, both explaining why the delegates should vote for our proposals, and explaining our criticism to the respective contra-proposal by the board of directors. TPB – Would you please give me the exact results, the vote-counting, for each of the grass-roots’ proposals rejected after the board’s suggestions? LE – No, I can’t, because the numbers were not given. The “moderator” just asked the delegates to raise one arm as to whether they agree or not with the proposals. That was all. One could see thou that the board proposals – opposing our proposals – had majority. TPB – You mean the vote was not secret? LE – It was not secret. TPB – Finally, may I ask you what is your feeling about all this, about what happened at the Amnesty meeting? LE – The worst is that they, the board, they lied to the delegates about their stance on guarantees of no-extradition for Assange. In the previous discussions they affirmed that a guarantee against extradition it would constitute a breach of the Constitution, “a crime against the Constitution” (“brott mot grundlagen“). That was a a strong argument, and a false argument, that convinced many delegates for not support our proposal on behalf of the human rights of Assange. But now the board is taking distance from that statement, and affirm that what they really meant it was, “it could be hypothetically that way”. TPB – Hypothetically? Excuse me, but this new statement from the board seems even worse than the previous one. If it is true that they believed only “hypothetically” it could result in a “crime against the Constitution”, well it is the same than to say that “hypothetically” it was not any crime at all. In either case they were obliged to search for an unequivocal juridical statement before plainly rejecting a proposal based on ignorance, or on that “they did not know what it could happen”. Photo above: The author [at left] and with the interviewed colleague Dr. Leif Elinder [at right] at the Grand Hotel in Lund. Since long ago Dr Elinder has been proposing at Amnesty forums and “policy-making”meetings human-rights action initiatives on behalf of Assange, Snowden, and the Guantanamo prisoners. Leif Elinder is a renowned Swedish doctor in pediatric medicine and a human-rights advocate, and he has also intervened in vital scientific research debates. A background on the situation at Amnesty Sweden with regard to the issues above, is found in the article by Dr. Leif Elinder, “A democratic Swedish ‘Amnesty International’ should support whistleblowers”, also published in The Professors’ Blog.